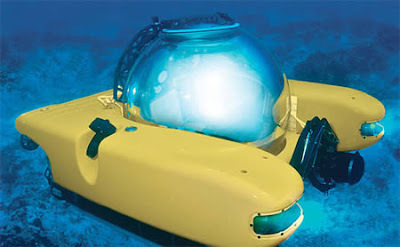 This is another personal submarine, and it is yellow. Unfortunately, it is not big enough so we all can live in it, as it only seats two people with upright seating. It is good for going 1,000 feet under the water, and the life support is good for six hours. It also features a 120 volt and 24 volt battery bank, two 3 horsepower main thrusters, two 3 horsepower vertical thrusters, four external halogen lamps, VHF communication radio, GPS, as well as a climate controlled sphere. I'm not certain what that means, but I'm guessing you can make it very warm or very cool in there.